4-ply blast hose is used in industrial settings where external scuffing and occasional light vehicle traffic is expected. It can be used with all common blast media. 4-ply hose is widely used in shipyards and railyards because it stands up to external abrasions from being dragged about the blast site. 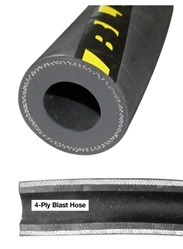 The tough outer casing of 4-ply blast hose can even withstand occasional light vehicle traffic without collapsing. Clemco 05061 Screw, 8-32 x 4"